Clean everywhere with The Hillyard Trident NM14 nano mop! 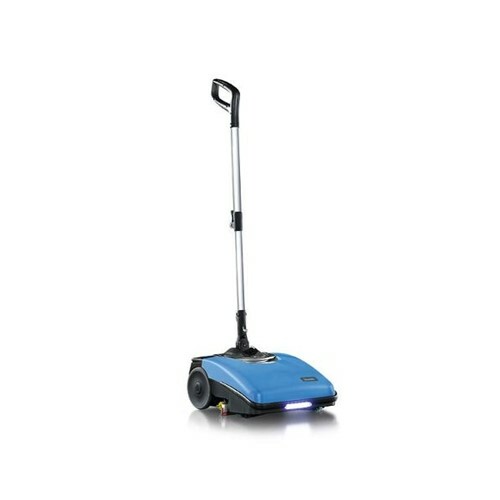 The NM14 is a compact, lithium-ion powered nano-scrubber that scrubs and dries in a single pass. The universal joint allows the NM14 to move in any direction, so you can reach anywhere, cleaning along the walls, in the corners and easily following the outlines of the furniture. Mops make the water dirty on the first rinse, but with the NM14 the clean water never comes into contact with the dirty water. And, the dirty water is not returned to the floor, giving you perfectly clean surfaces. Just add water and your favorite Hillyard cleaner, or fill right from your Hillyard Arsenal One dispensing system and you are ready to clean. The universal joint allows the NM14 to move in any direction, so you can reach anywhere, cleaning along the walls, in the corners and easily following the outlines of the furniture. The compact size and low height allows you to clean in very narrow areas without difficulty and even reach under tables and chairs with ease. Mops dirty the water on the first rinse, but with the NM14 the clean water never comes into contact with the dirty water. And, the dirty water is not returned to the floor, giving you perfectly clean surfaces. The squeegee collects the soiled solution. The floor is safe and dry - no need to wait!